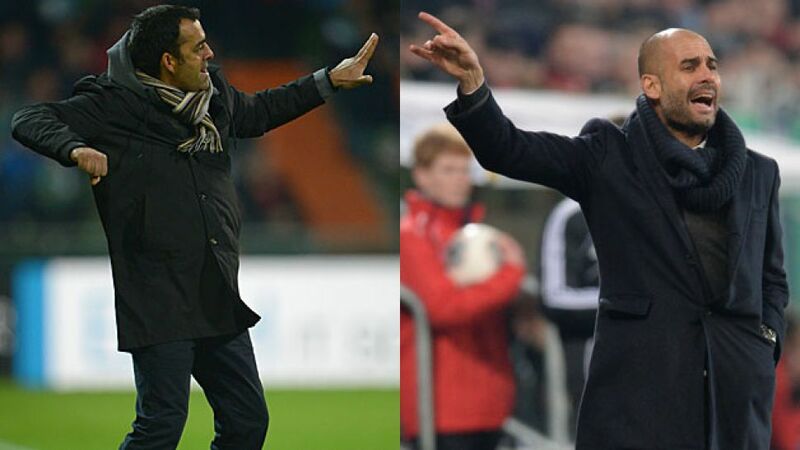 Bremen - SV Werder Bremen coach Robin Dutt has doffed his hat towards his FC Bayern München counterpart Pep Guardiola as he bids to become the first to beat him in the Bundesliga this season on Saturday (kick-off 15:30 CET). What Guardiola achieved with his former club FC Barcelona has earned global recognition, but the way he has seamlessly brought similar success with him to Bayern is equally praiseworthy, according to one of his biggest admirers. "There can be nothing other than great respect for him and adulation of his work," Dutt said. "His achievements at Barcelona were extraordinary, and now he has changed the style of play of a treble-winning side in only five months, and they are just as successful." The statistics back up the 48-year-old's admiration: Guardiola has yet to taste defeat in the Bundesliga, UEFA Champions League or DFB Cup since taking charge of the Bavarians in the summer. While Guardiola himself paid tribute to his predecessor Jupp Heynckes for leaving him such a strong and successful side, the Catalan has certainly played his own part in extending their unbeaten league record to 39 matches spanning two seasons. "Certainly in terms of his passing game and the way his players move into gaps, he has set new benchmarks in Europe," added Dutt, whose task it is to find a way of neutralising that game at the . At least Dutt must not fear for Arjen Robben beguiling his defence. The Dutchman has been ruled out for six weeks with a knee injury he picked up in Bayern's over FC Augsburg. While there may be a little Schadenfreude on Bremen's part, that will soon have been wiped away by the news that Ballon d'Or candidate Franck Ribery is now back and could return to the starting line-up on Saturday after a short absence due to a rib injury. With the Frenchman in their team, Bayern have not lost in 41 Bundesliga games, making the signs all the more ominous for the 2004 Bundesliga champions Bremen. Nevertheless, former Bayern striker Nils Petersen remains upbeat. "We've got to expect them to have 70 or 80 per cent of possession, but we're going to have to make the most of our 20 to 30 per cent," he told the Bild newspaper. "I'm a fan of statistics so I know they've got to lose sooner or later. Being able to hurt them and get the three points which we desperately need is the biggest motivation going. If we take the lead, then with the fans behind us, anything's possible," Petersen added. Guardiola, conversely, does not think as much about facts and figures. When asked what it would mean to be top of the table come the midway stage of the season, he said "Statistics like that aren't important." "The Bundesliga does not end at the winter break," he continued. "It's the first time in my career that I have a one-month break during the season and it makes me curious. It's great for me." It is also the first time that he is faced with such cold temperatures for such a sustained period of time, but Guardiola is taking that in his stride too. "It may be odd for us Spaniards, but the weather is the weather; everything remains the same."